It was the evening of Passage Day 4, just after the wind had died and we'd made the decision to start the engine, I looked over the stern and saw what looked like a huge gray animal following the boat. It looked like a dolphin, except for a huge trailing lobe on its tail which was more reminiscent of a shark. What's more, the animal appeared to extend directly under our boat, where I saw a flash of green---a dorado! My brain was telling me that I was seeing a shark or dolphin following our boat, chasing after a huge dorado under our stern. But my gut was telling me that we've never seen a shark following the boat and I didn't know if dolphin chased dorado. "Patrick!" I called for the second time, "Come see this thing! This thing following the boat is huge!" Patrick came and peered over the stern. "Uh, I think we've snagged something," the Voice of Reason said, as he reached over to take the engine out of gear. 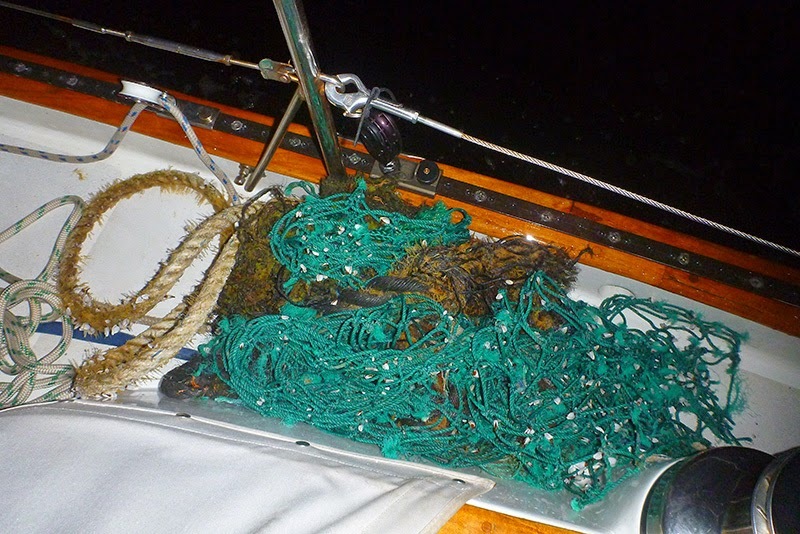 Sure enough, as the boat slowed down, I could discern that the flash of green I saw was actually green netting, and the large gray animal was comprised of other black and white portions of a large piece of discarded fishing net, including one of the bridles. Of course, I wanted to get in the water right away (with a safety line attached to the boat), because that would have been the quickest way to remove the piece of net and examine the prop. The sea was calm, and as there was hardly any wind, we were barely moving. We only had about a half hour of daylight left. The Voice of Reason spoke again, saying that we should exhaust all our other options for removing the net first; but I personally did not relish the thought of our other options failing and having to wait for daylight in order to get into the water. Since there was no wind, we couldn't sail; and since we were dragging a large piece of net, we couldn't use the motor: that meant drifting for twelve hours until daylight. However, since the Voice of Reason belonged to my skipper, I had to comply. We hauled as much of the net as we could onboard and tied it off to the winches with lines. The net was home to dozens of small crabs, which scuttled all over the deck. While hanging over the side, Patrick said he could see that the net was caught on our rudder---probably snagged on the shoe that supports the bottom of the rudder---and he could see it wasn't tangled in the prop. With the saw blade on his Buck knife, Patrick cut free the huge chunks of netting we had piled on deck. For the next step, a machete would have been handy; but since we didn't have one, Patrick attached his Buck knife to the end of a boat hook with hose clamps. Dusk was falling as I held a big spotlight over the side, while Patrick tried to cut free the remaining piece of netting still snagged on the rudder. Some strands were cut, but then it proved too difficult to see what he was doing with the swell moving both the boat and the spotlight I was holding up and down. Patrick said, "There's not much left, I'll bet if we motor ahead, it will just stream out behind the boat. I don't think the piece of netting remaining is long enough to reach the prop." I still wasn't convinced there wasn't a piece we couldn't see already caught on the prop. Patrick asked me to put the engine in gear, and I tentatively did so. "Give it a little gas," he said and I did. "Give it some more gas." Finally, I heard Patrick say, "It's free!" The movement of the boat through the water, combined with the severed strands, had removed the final stubborn piece of netting from the rudder. I looked at our speed over ground. At first it seemed slow, but as I brought the throttle up, I realized we were moving at our normal speed. There probably wasn't any net caught on the prop after all. That was Day 4. Backing up a bit, our passage slowed down to a crawl after our exhilarating twenty-four hour period of sailing on Day 3. We sailed ourselves into an area of light and variable winds, in which conditions changed on a dime. A rain squall passed over us, and the wind changed direction from southeast to west in a heartbeat, sending the boat off course and us scrambling to get her back on course and re-trim the sails. Or the wind speed increased from five knots to 17 knots in a matter of minutes, plunging us from motoring mode into sailing mode. Then, just as suddenly, the wind would die again. We've done a lot of setting and furling the jib in the past couple of days. Most recently, we've had no wind at all and have been motoring in fuel conservation mode, keeping our rpms low, and consequently, so too our mileage made good. Our daily mileage for the past three days of motoring interspersed with sailing has been 91 nm, 82 nm, and 79 nm, not all of it in the right direction. At least we have been making forward progress, if at a slow pace. This afternoon, we shut down the engine and just drifted for four hours in the sunshine and a rolling, long period swell. Patrick wanted to cool the engine down so he could check it and check the oil. We are motoring again, but the weather forecast predicts that we will get some wind tomorrow. The wind will be associated with a low that will be passing over us. On our weather files, this area appears jet black, meaning it will bring precipitation with it. Lots of precipitation. We can expect torrential rain and a wet cockpit starting tomorrow afternoon. This is one of those occasions when you look forward to the low, because at least it will bring some wind with it. And if we remain patient with what will hopefully be the last of these trying conditions, we will emerge into some strong, usable wind surrounding the high pressure system that awaits us on the other side. Posted from sea via Ham Radio. Photo added after arriving in port. I would like to publish an article on Silhouette in Dutch E-zine "de Polyclassic Zeiler". The magazine is about classic polyester sailingyachts.